Last Tuesday we hosted one of our most ambitious WineChap Nights to date: A Wine Safari Dinner with PIWOSA at Brunswick House Café for 45 guests. PIWOSA is a brand new initiative, a group of top Western Cape producers who have banded together to promote their wines and the UK was their first destination. 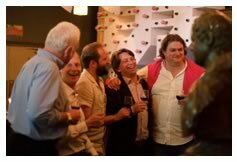 We were delighted to be joined by Rollo Gabb (Journey’s End and PIWOSA Chairman) – a long-term friend of WineChap, Ken Forrester, Bruwer Raats and Paul Cluver who presented their top wines and played musical chairs throughout the evening in order to chat to as many WineChap Chums as possible. We started with Bruwer’s Old Vine Chenin Blanc and Paul’s Chardonnay, the two lighter whites from the selection and both showed well – fresh but ripe citrus, a touch more honey and ginger on the former and a little more brioche on the latter, both excellent intensity and character. 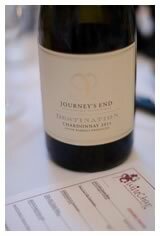 With our samphire, new potato and crab salad it was the turn of the richer whites – firstly Journey’s End Destination Chardonnay, a WineChap fave and then Ken’s extraordinary FMC Chenin Blanc – a powerhouse white if ever there was, full of apricots, vanilla pod and cinnamon-flecked crème anglais. First red up was Paul’s Seven Flags Pinot Noir (the estate was one of the recently accorded “1st Growth” status in Tim Atkin MW’s first ever classification of South African wineries) which intrigued with its wild strawberry and earthy character, probably needing a little more time to sing at its peak. Great slabs of rare roast beef were then served on platters as the Cabernets were wheeled on: Raats has established itself as the top producer of Cabernet Franc in Stellenbosch and Bruwer achieves impressive depth and balance, again maintaining a freshness which makes the wine highly digestible (92 WA). Journey’s End Cape Doctor is one of the most impressive Cabernet Sauvignons in the Cape and drinking the 2007 at 13.5% unquestionably one of the most elegant and deceptively Old World in character. A selection of Neal’s Yard cheeses followed with Ken Forrester’s The Gypsy and Paul Cluver’s delightful NHL Riesling dessert wine which was a number of guests’ surprise wine of the night. As Ken had said earlier “South Africa gets all the sun it needs and quite a lot of other people’s too!” and The Gypsy, a 5* rated wine by SA expert John Platter and subject of today’s Drink WineChap offer, clearly showed this with its warm, spiced blackberry crumble character balanced by herbal and softer red fruit notes. All in all – a lively and bibulous evening – wonderful venue and food, terrific wines, generous and engaging hosts and an appreciative crowd. 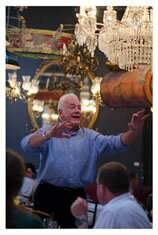 Thanks to PIWOSA and Brunswick House and all our guests.